We all know that Facebook is an amazing social media platform connecting users globally. Statistics Portal states that as of the first quarter of 2017, Facebook had 1.94 billion monthly active users. The Balance highlights that more than 250 million people access Facebook over a mobile device, and they are twice as active on Facebook as desktop and laptop users. Thus won’t such a platform be a perfect medium to showcase the mission of a Nonprofit? Of course it is! 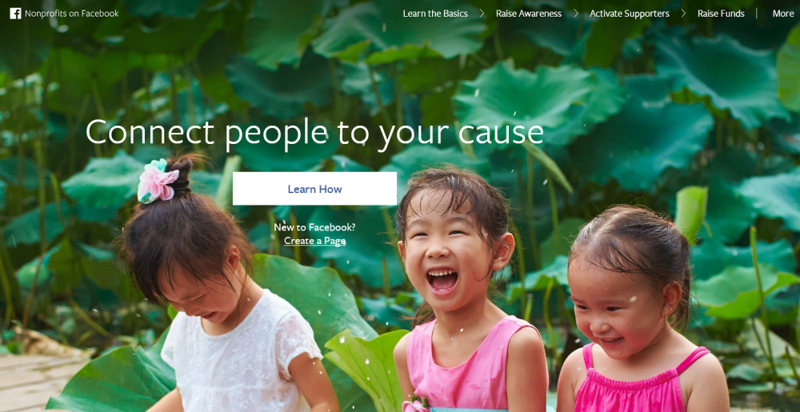 And Facebook has a dedicated page for enabling Nonprofits to raise funds and create awareness. 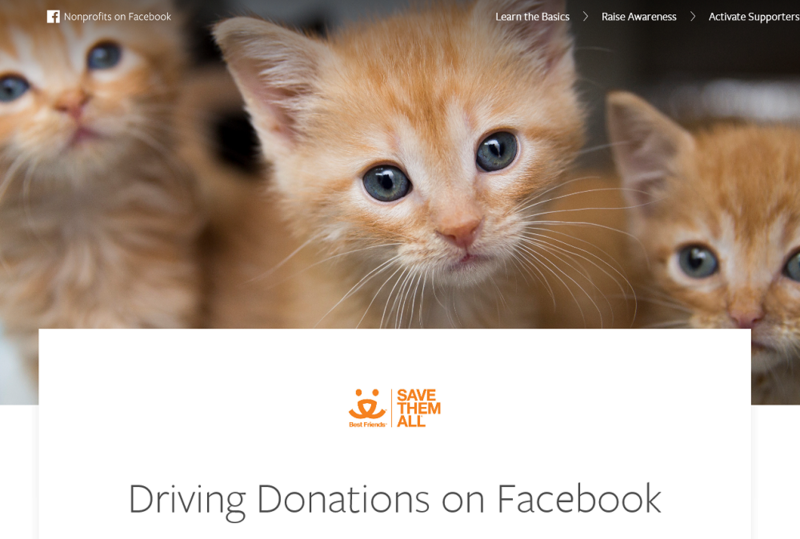 There are several success stories of Nonprofits who have benefitted from Facebook. Children’s Medical & Research Foundation’s challenge was to connect to people on Facebook and then to turn them into a community willing to fundraise on behalf of the organization. CMRF Crumlin has a Facebook Page and has received thousands of likes on some of their posts, but it was never able to convert this engagement into fundraising success and by using the fundraising features on Facebook, the organization reported that it successfully raised €60,000 during the course of its holiday campaign. Best Friends Animal Society created an ongoing Facebook campaign centered on Facebook’s Donate button. Their goal was to figure out how to better drive donations on Facebook and evaluate the ease of the Donate button against other methods of raising money on the network, like redirecting to their own website. The campaign raised $13,000 and the strategy relied upon posts that were relatable, personal and most importantly told a compelling story. Instead of communicating through social media posts in broad terms about the need for donation for animals, a post would focus on a specific animal and how a donation could make a difference in that animal’s life. Nonprofits on Facebook is an ideal page for involving the community, raising awareness and generating funds for a cause. The page gives a step by step detail on learning basics of creating a page, call to action, the various fundraising tools and ways to raise funds. 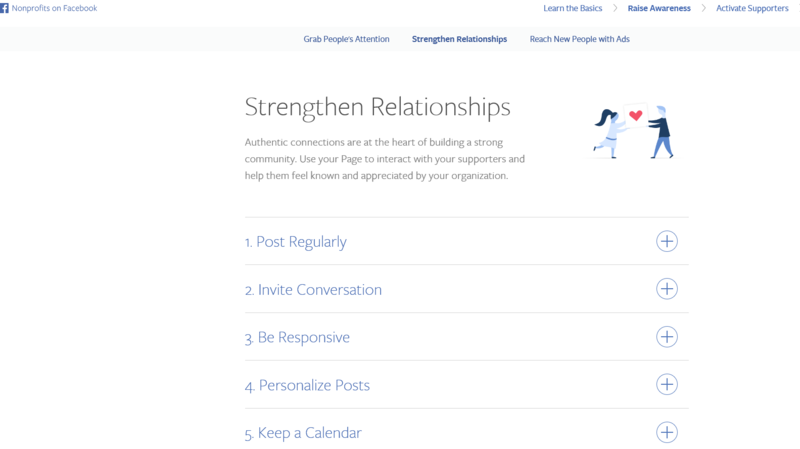 Learn the basics has 5 subheadings which shall guide to create a Facebook page of Nonprofits. Choose the page category they want to, how to add favourites and manage the page. How to optimize your page through a noticeable profile picture, how to use high resolution images and authenticate your page with a verification badge. 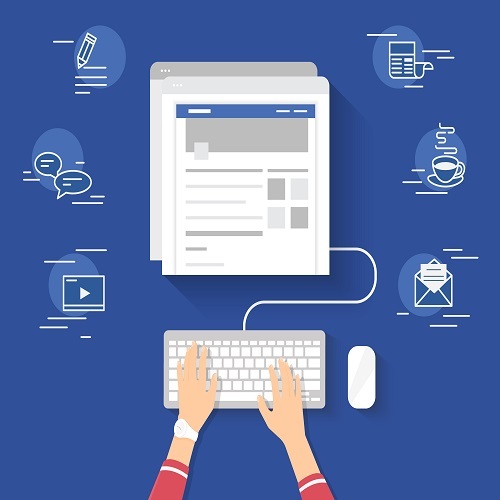 As the primary communication on Facebook happens through posts the Nonprofits are enabled to engage their posts with videos, images and after publishing the admin can pin or embed or delete a post and comment too. Nonprofits on Facebook shall direct the admin on ways to attract audience and engage them on your page. 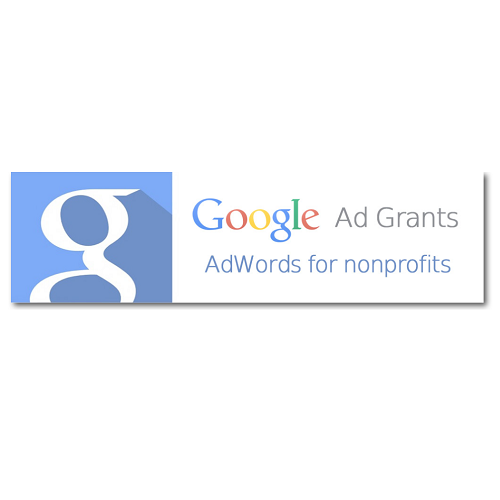 Nonprofits have the scope to link their web page or landing page and add a Social Plugin on the blogs. There is detailed elucidation on focussing on the Page Strategy. It is recommended for Nonprofits to read the points and elements accurately as it shall give them an insight into how to create an effective page. The next section Raise Awareness, focuses on how grab the attention of facebook users, using of creative ads and reaching out your objective strongly and emphatically. 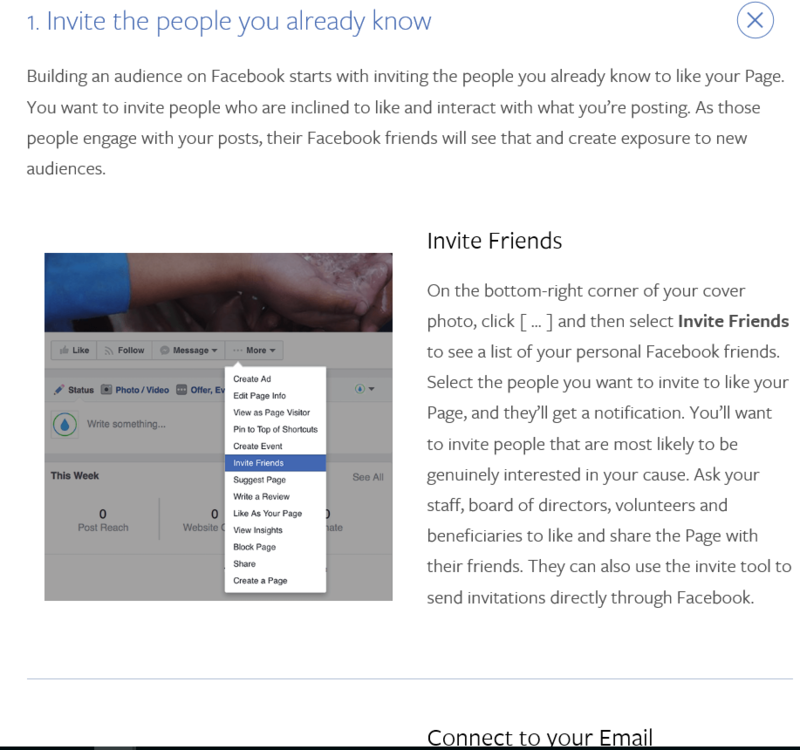 Facebook emphasises on knowing the audience and tapping people who share posts that reflect the Nonprofit’s perspective. It is recommended to use personal casual style of writing which shall evoke emotion and not alienate people. Have an engaging inspiring solution headline and message. It is prudent to be truthful and authentic about your objectives, interventions and expectations from supporters. Strengthen Relationships shall enable Nonprofits to engage better. It is advisable to use eye-catching visuals, videos, infographics etc. 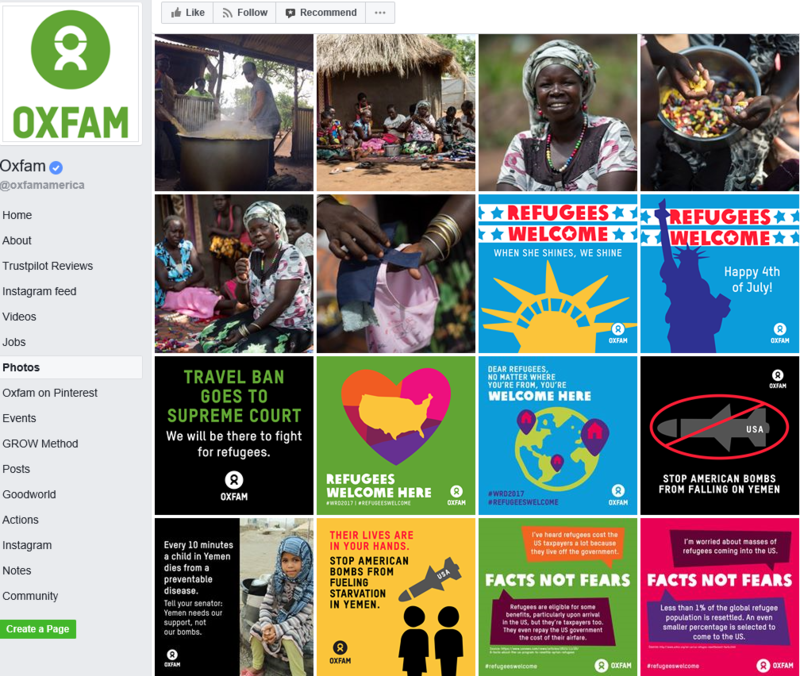 Oxfam America flashes absorbing images and infographic which makes a supporter go through the entire post. Ads on Facebook gives greater access to the people you want to connect to achieve your mission. You can choose your objective and audience and Facebook will deliver your ads in a way that’s optimized to drive your desired results. You can run ads on Facebook on any budget, starting as low as $5. This section shall support and guide Nonprofits on how to reach out to target audience and ‘Call To Action’. It encourages people to take online actions like sharing their stories, buying a t- shirt of the cause or changing profile photo. Facebook emphasis that Nonprofits should keep their requests for supporting ambitious but realistic projects. People take action online when they believe it will create change in real life. 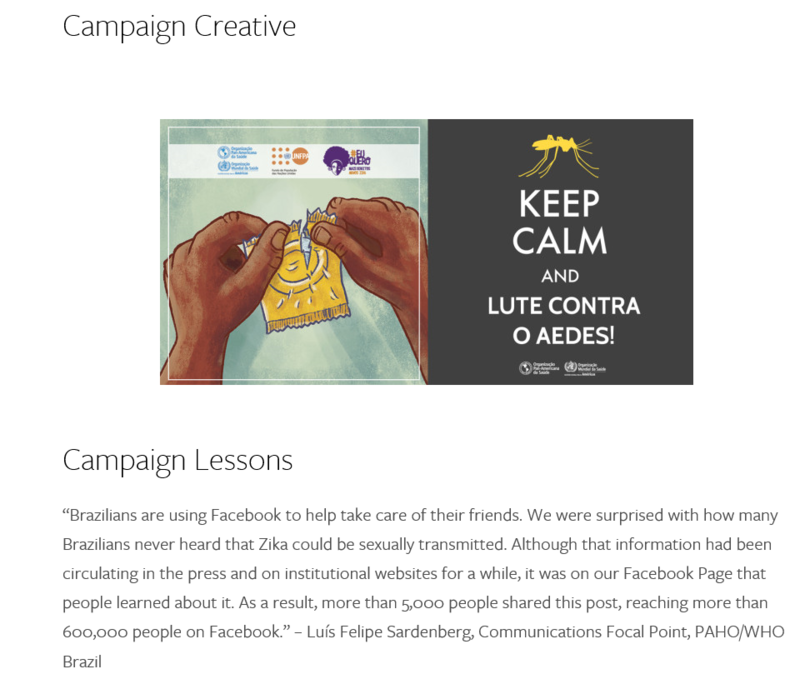 PAHO Brazil used Facebook posts to reach over 500,000 people in less than 48 hours with messages about preventing the sexual transmission of Zika. Facebook can help you organize people both online and face-to-face supporters. It lists out the elements to be adopted for follow- up. The instructions clearly state how to build anticipation, send invitations and help complete your page on fundraising. Lastly Facebook shall help to find volunteers, supporters in the geographical locality of the Nonprofit. It advises on celebrating people’s support by tagging them and advises to consider creating a group with members who receive special messages, swag and recognition. The section on Raise Funds has 5 well defined guidelines for Nonprofits. 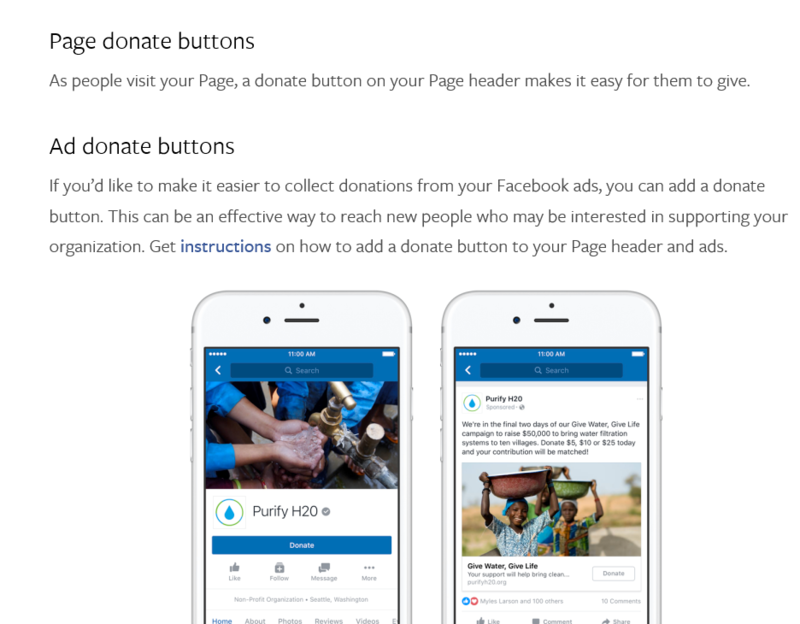 Facebook has built tools to help you collect donations and enable supporters to fundraise for your nonprofit. 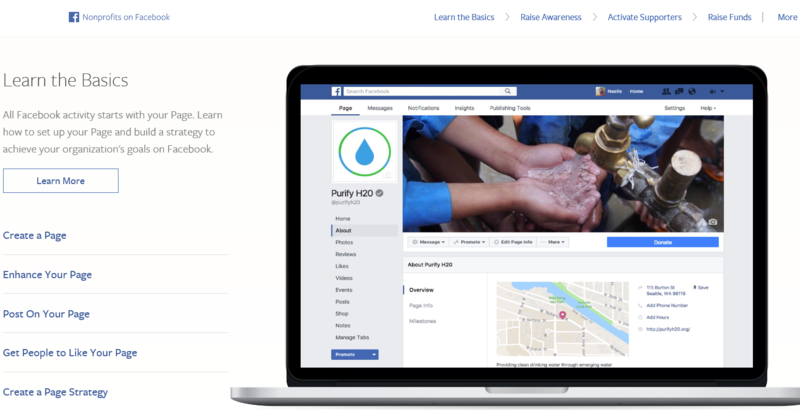 Facebook enables donors on two fronts. 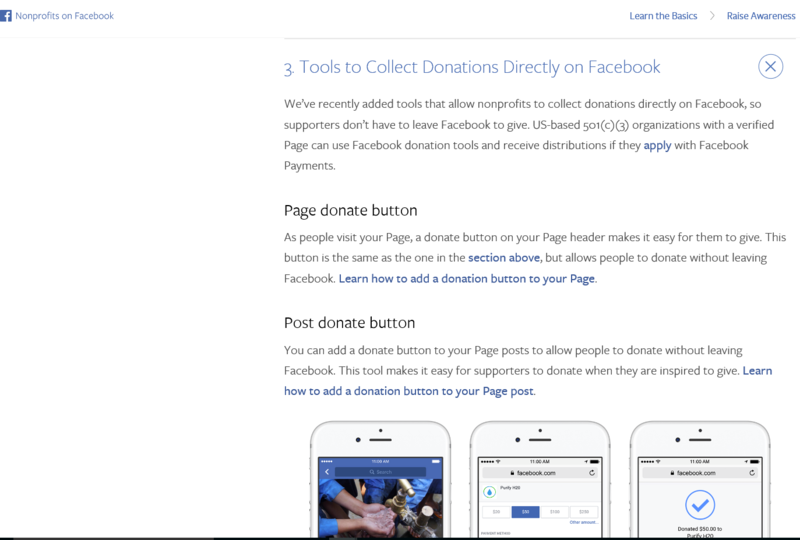 Firstly it guides the Nonprofits to use tools which shall send supporters to a website of their choice and secondly it allows nonprofits to collect donations directly on Facebook. 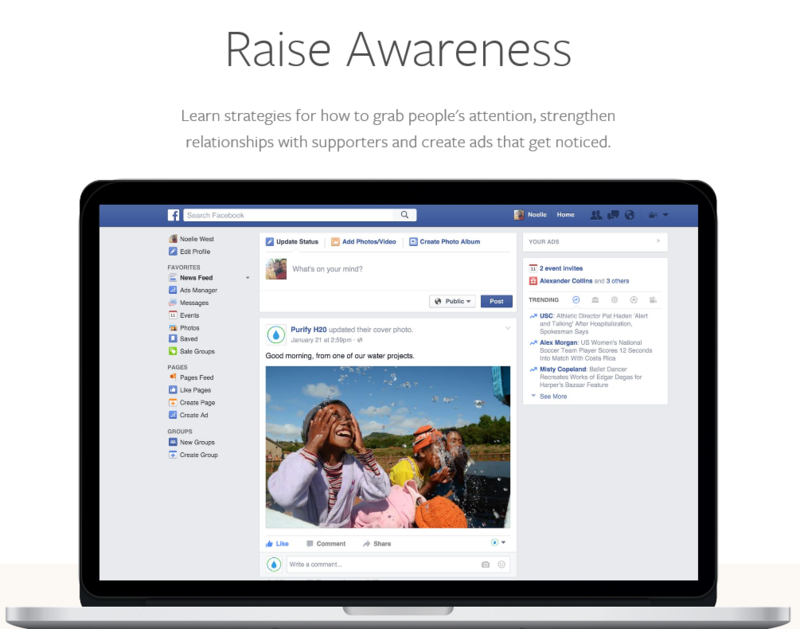 Facebook provides a wide array of tools to activate supporters for fundraising. Nonprofits must apply and be approved by facebook payments. Live video can be attached to the fundraiser page or Nonprofits can have a customized landing page and supporters who may not want to create a fundraiser can easily add a donate button to any post. 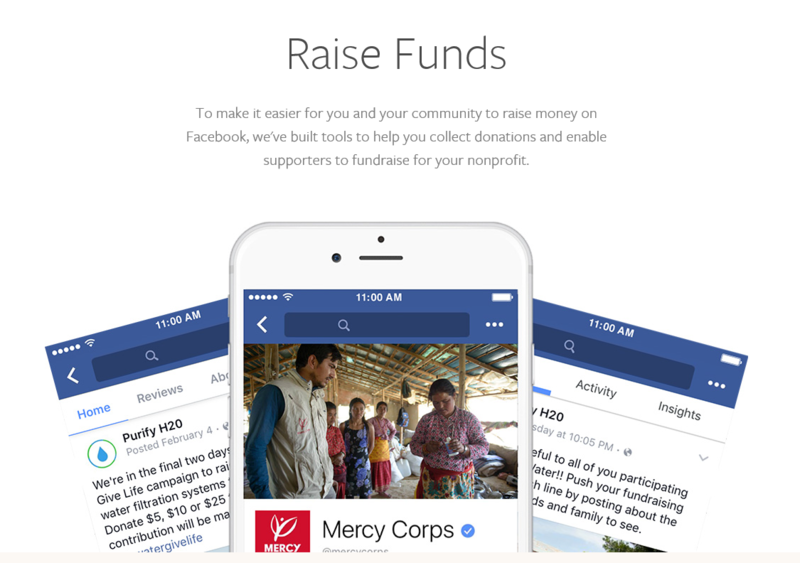 Nonprofits on facebook can have details about payment, payout and reporting processes for fundraising using Facebook Payments or Fundraisers. The various payment options, processing fee, payout details access and publishing donation reports are all available. For Nonprofits, this is a practicable option to showcase their cause. Nonprofits on Facebook is a holistic comprehensive package which shall help to build a brand of supporters and community network.